Yet the number of paid police staff including Police Community Support Officers (PCSOs) has dropped by 4,177 – or 5% – from 80,749 to 76,572 over a similar period, according to government figures*. –* The Home Office figures are from September 2014 to September 2017. – A total of 32 police forces responded in full to UNISON freedom of information request in July this year. 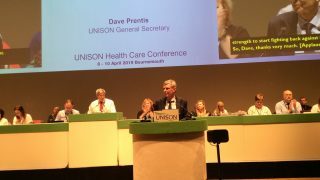 The request was sent to all UK police forces where UNISON has substantial membership and did not include the Metropolitan or City of London Police forces. – A summary of Crossing the Line can be found here. The full report is available on request from the UNISON press office. – UNISON is calling for proper funding to be restored for policing in the 2019 comprehensive spending review. – UNISON is working with the National Police Chiefs’ Council to seek to ensure that volunteering in policing is in roles that are appropriate, and that don’t stray into operational, or safety critical areas. 999 call takers, fingerprint experts, and many other essential policing roles.– The 2017 Policing and Crime Act allows chief constables to designate volunteers with all police powers, with the exception of powers of arrest, and stop and search which will remain exclusive to police officers.